The Schafbergbahn is a railway that starts in St. Wolfgang am Wolfgangsee and takes you up to the summit of the Schafberg. Due to the scenery of the surrounding landscape, it is one of the most popular mountain excursions of the Salzkammergut. Among international tourists, the Schafbergbahn is known from the kitsch-until-you-puke musical "The Sound of Music". The highest point of the Mount Schafberg is 1783 metes high and offers exceptionally beautiful views on the Salzkammergut with its many mountains and lakes. The summit of the Schafberg had been a tourist attraction a long time before the construction of the Schafbergbahn. In the 19th century, the "Sommerfrische" or summer vacation became a fashionable thing; first for nobility, later for aristocrats and even later the middle class of Vienna. The Salzkammergut took a pioneering role in the development of Sommerfrische destinations. Within a relatively short amount of time, the villages and towns developed a proper tourism infrastructure, which included men that carried tourists up to the summit of Mount Schafberg on something like a litter. By the late 19th century, there were some 30 professional litter-bearers in St. Wolfgang only. Therefore, the construction of a railway to Mount Schafberg was an obvious thing to do. The permission to construct such a railway was granted in 1890. The construction of the almost six kilometre long railway track took three years, the use of many mules and some 300 labourers from Italy. The opening ceremony was held in 1893. Originally, the Schafbergbahn belonged to a network of regional railways of the Salzkammergut; due to financial difficulties, it was sold to the Österreichisches Verkehrsbüro in 1932. In 1938, it became property of the national railway system of the Third Reich and after the war, the Schafbergbahn was taken over by the Austrian National Railways (ÖBB). The National Railways, in turn, sold both it cruise lines on Lake Wolfgangsee and the Schafbergbahn to a semi-public power supply company from Salzburg in 2006. Whilst this probably won′t mean much for you, it means for me that my railroad card doesn′t get me a discount for cruises or the Schafbergbahn anymore. Some technical information on the Schafbergbahn: The steepest advances are 25.5 percent - meaning that on a distance of 100 metres, the railway moves some 25.5 metres upwards. This doesn′t sound like much, but it is. Over the distance of six kilometres, the Schafbergbahn goes up some 1190 metres. The railway works with cogwheels that run along the centre of the rails on an additional, cogged rail. There is no electricity involved, all energy is generated with partly historic steam- or diesel engines. Most of the regular rides are done with replicas of the original steam engines, which wee built after 1992. There are two historic steam engines preserved, built in 1893 and 1894; both of them are used only rarely for special outings on certain dates ("Nostalgiefahrten"). If you are keen on riding the historic ones, just ask for the Nostalgiefahrtplan at the ticket office for information on dates and times. Speaking of time: A ride takes approximately 40 minutes. Every year, the Schafbergbahn transports some 600,000 passengers. 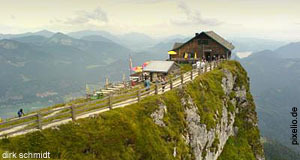 The Schafbergbahn is among the most popular tourist attractions of the country. Other attractions nearby include the towns of St. Wolfgang and St. Gilgen; the town of Mondsee and the surrounding Mondseeland; the village of Fuschl and the crystal-clear Lake Fuschlsee; Bad Ischl, Bad Goisern, Hallstatt and Gosau; Lake Attersee and surroundings; and - on the Salzburg-side, the cities of Salzburg and Hallein. As you see, all tourism-hubs.